Occasionally a customer may over or under pay. There are numerous reasons why this might happen, and you'll need to decide what you want to do in each different case. We recommend you consult your accountant before writing-off accounts receivable / debtors balances. An underpayment is where a customer doesn't send enough money to cover the total amount of the order or invoice(s) they are paying. The remaining balance might be an amount that they will pay later, in which case it can be left outstanding on their account, or it might never be paid, in which case it is likely that you will want to write it off in order to balance the account. Please check with your accountant before writing balances off. Note that manually entered (JJ) journals cannot be assigned to a contact and therefore cannot be used to write-off accounts receivable / debtors balances. Use these steps when a payment doesn't match the invoice amount, but the balance needs to be cleared from the account. This can occur due to an under payment, and over payment or exchange rate differences. These steps can be used where the adjustment is being made at the same time as entered the payment. Open the contact record and navigate to the payment allocation screen via the financials box on the right-hand side. Enter the amount paid against the relevant invoice(s). 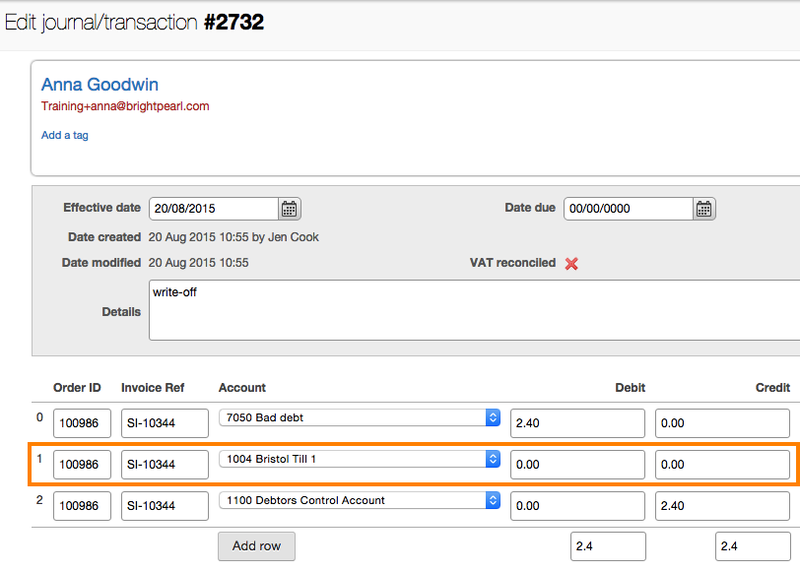 Enter the difference between the invoice and payment amount into the Adjustment field. An adjustment code field appears below the table where you can select the nominal code to post the write-off amount to, for example, "bad debt" or "write-offs" or "gains and losses". (Nominal codes are listed when they are set to "Yes" for "Allocate discounts to this account?"). Go to Customers > Quick Credit . Search for the customer (only primary customer contacts are searchable). Enter a note in the details section to record this as a bad debt write-off. Select your "bad debt" nominal code (you may need to create one). You then need to allocate this credit to the outstanding invoices on the customer's account so that they no longer appear on your aged debtors listing. Search for the customer and navigate to the Payment Allocation screen. Identify the invoice with a balance to be written off. Enter the whole amount to be written off into the Adjustment field. In order for the process to work Brightpearl requires a balance in the payment field too, so just enter 0.01 for now, this will be removed in a moment. At the bottom select the account code to which the balance needs to be written off to. Only account codes with "Allocate discounts to this account?" set to Yes, will be available to select here. Enter a reference and then click the Allocate payment button. If you see a warning about the over allocation, that's just that 0.01 you entered which you will remove now. Go to Reports > General ledger and click on the journal ID to view it. Change that 0.01 to the bank account to 0.00, enter a reason for modification and then save. The balance has been succesfully cleared from the customer account. An overpayment is where a customer has sent more money than is needed to cover the total amount of the order or invoice(s) they are paying. The remaining balance might be an amount that they can use later on a future purchase, in which case it can be left outstanding on their account, or it might be refunded to the customer, or the credit it might never be taken, in which case it is likely that you will want to write it off in order to balance the account. Go to Customers > Quick Invoice . Select the invoice date and due date. Automatically calculate a due date by clicking +30 Days . Select the tax code to calculate the tax and total values. To simultaneously create a bank receipt and mark this invoice/credit as paid, select the Mark as paid at the same time checkbox. The journal is created and posted and the reference displayed in a green message box.